Collect and edit field data in a disconnected environment. Access real-time operation views from web browsers. Take advantage of new data sources. The Collector for ArcGIS and Operations Dashboard for ArcGIS apps were recently updated with notable enhancements to better support users' workflows. These apps pull together and disseminate your most current geographic data while connecting the activities of your field and office staff. 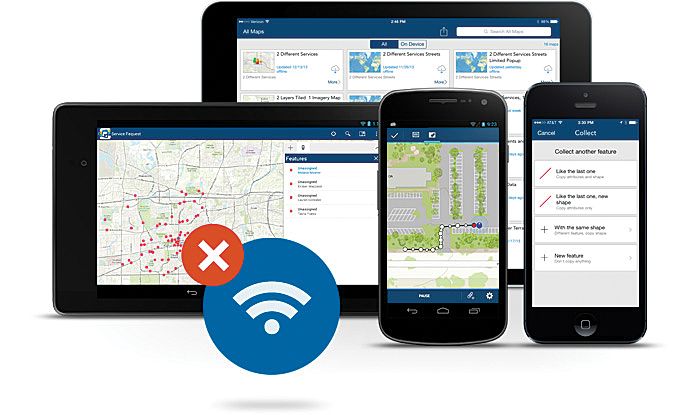 Use the Collector app offline to collect and edit maps and data, regardless of your network availability. Collector for ArcGIS is a native, configurable field data collection app to improve the accuracy and currency of spatial data. It is designed specifically for iOS and Android devices. The Collector app is a companion to Operations Dashboard, but it can also be used in a stand-alone environment. Field crews can download maps using Collector and then capture spatial or tabular data, attach photos and video, plan routes, and get directions. Information can be transmitted and immediately displayed in Operations Dashboard and shared throughout an organization. Collector now has the ability to work in a completely disconnected environment. Maps can be downloaded to users' smartphones and tablets and accessed anywhere, regardless of network availability. Users can take maps offline to collect and edit information in remote locations where network connections are either nonexistent or unreliable and then synchronize changes when reconnected. Operations Dashboard for ArcGIS provides a common view for monitoring, tracking, and reporting events within an organization. It integrates interactive maps and data to create operation views, including bar charts, lists, histograms, gauges, and other performance indicators based on live geographic information defined in a web map or web service. The dashboard was originally designed for Windows desktops to create and manage focused views of real-time information that can be shared across an organization. Today, Operations Dashboard supports web browsers on iOS and Android tablets. That means users can have the same real-time view of operations on their tablet that they see on their desktop computer. Data sources inside Operations Dashboard have been enhanced. Users can now power operation views using dynamic map services, as well as feature services, and other types of layers, including real-time weather, traffic, and social media feeds. Collector for ArcGIS can be downloaded directly from the Apple App Store and Google Play. Operations Dashboard is available from ArcGIS Online. Both apps are free, but users need an ArcGIS Online paid or trial subscription to use them. Portal for ArcGIS users can access Operations Dashboard from the Esri Customer Care portal.